After leaving M'town, I met and married Rocky Price. I've been in Osceola ever since. Our marriage lasted about 18 yrs. He passed away 2 yrs. later. I've been blessed with 2 step-grandsons. Meghan will make me a grandma again in Nov. She lives in Loveland CO. and has followed in my footsteps as a hairstylist. She works for an Aveda spa&salon. I then was in a relationship with a songwriting cowboy.WHAT WAS I THINKING!!!!! I've always prided myself as a rock and roll chic, he even dragged me to Nashville, to the grand ole opry, backstage passes, I met Brad Paisley, Little Jimmy Dickens, Trick Pony, Porter Wagner and many others. I finally woke up and ended that relationship. He moved to Nashville and is still trying to make it as a songwriter. In 2005 Todd Fletcher and I started seeing one another, shortly after he moved in with me. We had the best 4 yrs. together. He was my best friend, he taught me how to play golf and I love it! 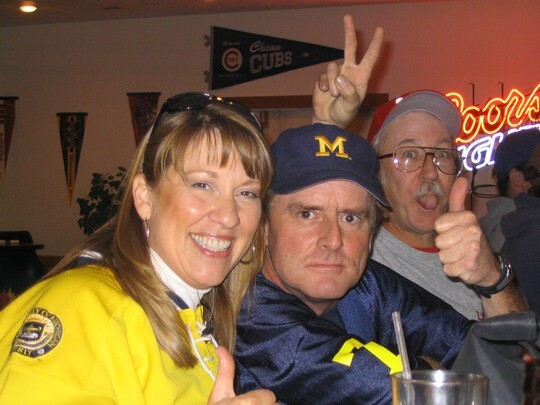 ( I play on the woman's league, am a board member of our club, and that's where you'll find me when I'm not working) I became a Michigan and a Redwings fan. Todd lived in Michigan at one time. We went to hockey games in Des Moines, took in a lot of ROCK concerts, traveled to Colorado and spent a lot of time golfing. He was diagnosed with esophageal cancer in the spring of 2007. He put up a brave fight till the end. He passed away last Aug. The last 2 yrs. have been really hard for me. Now that I have a grandchild on the way, I can possibly see a future in CO.
Shannon Cassiday Price has a birthday today.